The Instagram pic (below) showcase the amazing body and growth development of this lovely Wada Asagi over a 1 year period from 39cm Nisai (Nov2017) to 58cm Sansai (Oct2018), while kept under Azukari in Japan with Wada Koi Farm. The fukurin of this Asagi is mesmerizing! Many thanks to Wada Suguru san for the fantastic keeping skills. This lovely Wada Asagi went on to clinch 1st Prize Winner for 60Bu Asagi at the 38th Uonuma Nishikigoi Show in Japan on 13 October 2018. Watch the Instagram Video (below) to enjoy her body shape and enchanting crystal-like fukurin scalation on her body. Marugen Koi Farm is excited to showcase the sumi development of our Marugen’s bred Kinginrin Shiro Utsuri. The picture on the left below was taken just before the 18th Singapore Koi Show (25th-27th April 2014). It was 3.5 months old and measuring at 13cm then. 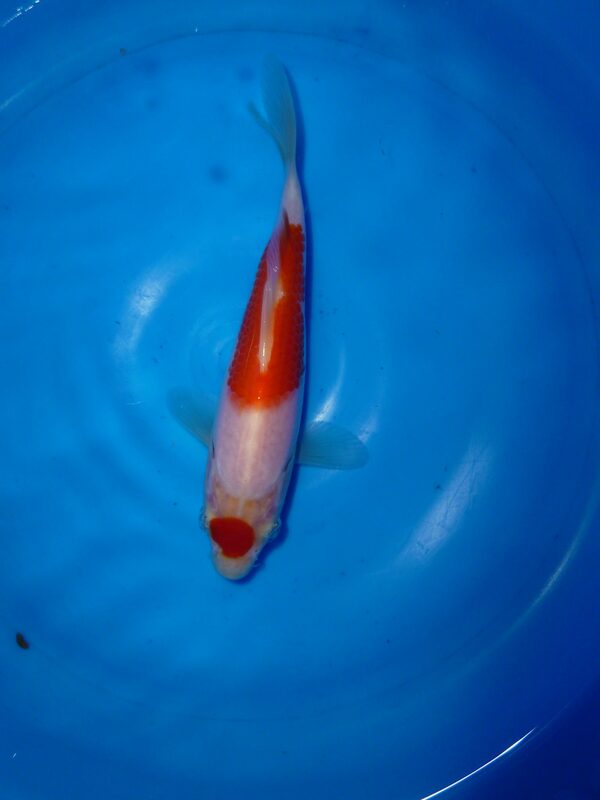 During the koi show, this shiro went on to win 1st Prize in the Kinginrin Group A, 15BU category. The picture on right below is the same fish, taken a month later, now measuring at 20cm. Notice the amazing sumi development of this shiro, within just a short span of 1 month, not forgetting the rapid growth from 13cm to 20cm over the same timeline. An Offspring of “Black Beauty”, this kinginrin shiro utsuri has solid body conformation, and possess excellent skin quality; thick sparkling ginrin scales, shiny deep black sumi, and porcelain white shiroji skin. It’s mother parent koi “Black Beauty” is a Shiro Utsuri from Omosako Koi Farm. During this one month growth period, this kinginrin shiro utsuri was kept in our Marugen Koi Farm’s mud pond facility; where minerals and nutrients that are found naturally in the mud pond, act as essential health supplements for kois to grow healthy and develop better. This fish has now been sold and shifted to its new home sweet home. 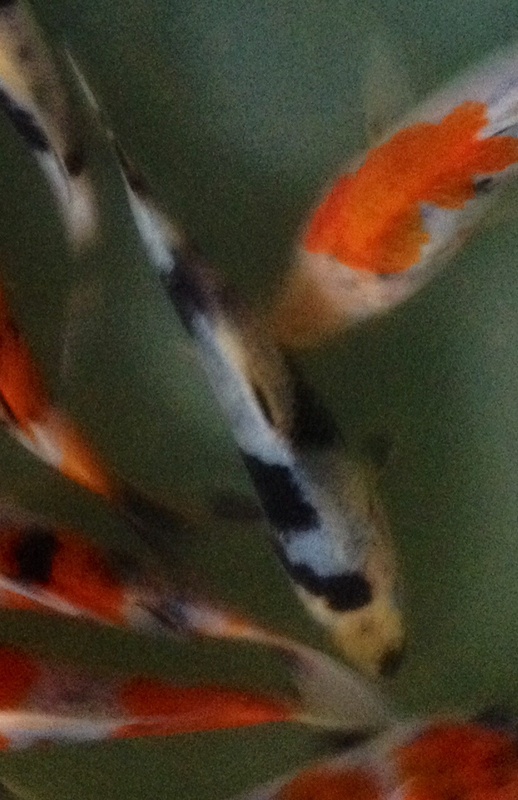 Marugen Koi Farm is pleased to showcase the growth development of our Marugen farm bred Maruten Kohaku Koi. At 2.5 months old, this Maruten Kohaku was measuring a mere 9-10cm in size. 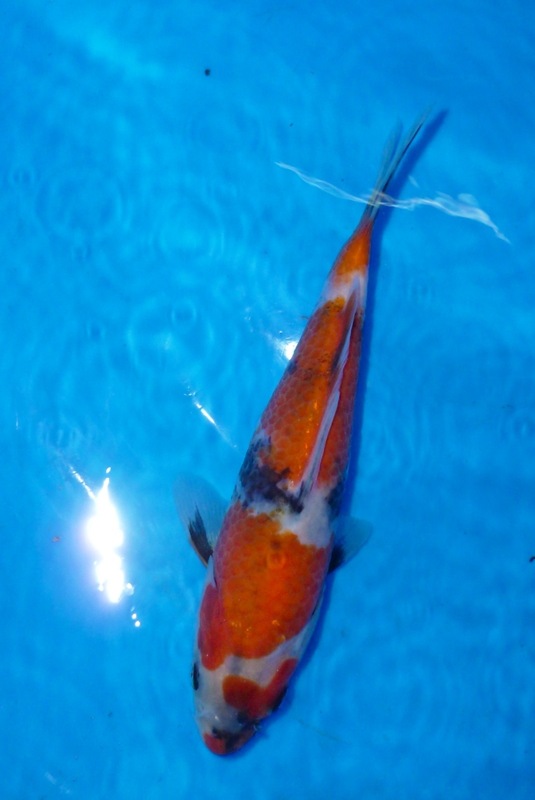 Suspected to be a Male koi fish at 2.5 months old, it had only a simple maruten pattern, but its skin quality was very good; snow white shiroji skin, thick layer of red beni, and very clean-cut kiwa. Instead of keeping in our mud pond, this Maruten Kohaku was brought home to keep in our home cement pond, partly to experiment on how our Marugen farm bred koi can adapt at home cement pond. It was fed solely on 50% Marubeni Growth Diet Feed, and 50% Saki Hikari Colour Enhancing Feed, once but mostly twice a day. Take a look at the following video clip of the same Maruten Kohaku, taken at 8 months of age. Now at a mere 8 months old, this Maruten kohaku has been confirmed to be a Male fish, with his rough prickly facial and fin texture. Despite being a male fish, he has grown to a whopping 42cm in size. He has also developed very strong and solid body conformation; thick high body all the way to the tail tube, and solidly muscular shoulder. Skin quality remains very good; snow white shiroji skin and thick layer of red beni, with clean kiwa cutting. 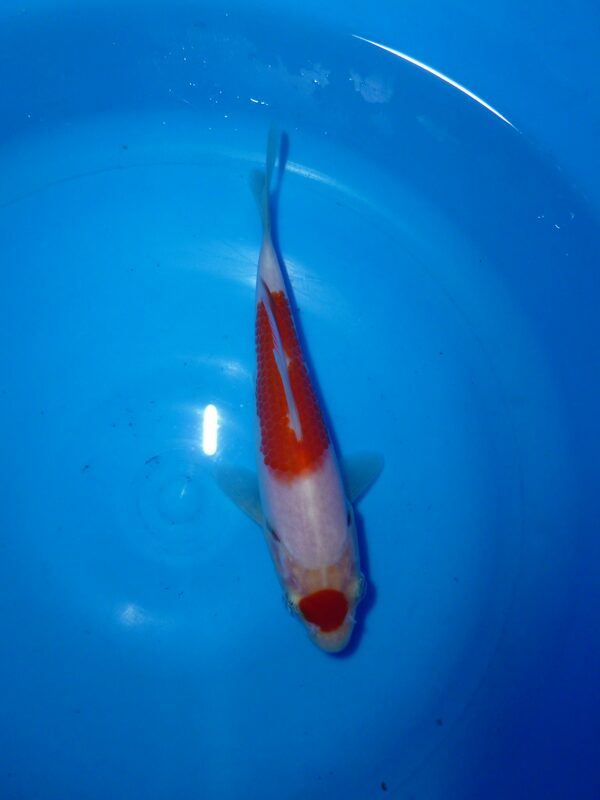 This strong male Maruten Kohaku has just been sold to an avid koi hobbyist and very good friend and brother of ours. And we expect this Male fish to continue to develop into a fine quality koi fish with excellent body shape, at his new 60 ton home! Interested to view the siblings of this solidly-bodied Marugen Maruten Kohaku Koi and many more specially selected top picks, or purchase quality Made-In-Japan koi feed from Marubeni and Saki Hikari (tested and proven), please fill in your contact details below, and we will contact you soonest possible to arrange an appointment to visit our farm. Marugen Koi Farm is pleased to showcase 3 pieces of our Marugen farm bred Shiro Utsuri Koi Fishes, now at about 6 months old. All three are siblings, and offsprings of “N’Panda”. Female parent fish “N’Panda” is a Shiro Utsuri bred by Omosako Koi Farm. This Marugen Shiro Utsuri Koi Fish has an attractive well-placed Sumi pattern, and snow white shiroji skin. At only 6 months of age, she is far from being a finished article, but is already a show quality koi fish! The same Shiro Utsuri Koi Fish, with picture (below) taken during culling at 2 months old. Notice the improvement in Shiroji Skin. Another Marugen Shiro Utsuri Koi Fish with snow white Shiroji Skin, and very strong body conformation. This Marugen Shiro Utsuri has a lovely kuchi-sumi. With more underlying sumi expected to appear under the shiroji skin, she is definitely a Shiro Utsuri Tategoi! All three pieces of Marugen Shiro Utsuri Koi Fishes have been sold, and are currently being groomed in our Marugen Koi Farm’s mud pond facility; where minerals and nutrients that are found naturally in the mud pond, act as essential health supplements for kois to grow healthy and develop better. Marugen Koi Farm is pleased to showcase the growth development of yet another Marugen Kindai Showa Koi. She is currently being raised in our mud pond facility in Singapore. The comparison is made between a quick snapshot picture taken when the showa was undergoing culling at an adolescence age of 2.5 months old, and a recent video clip taken when the same koi fish is now about 5 months old. This Kindai Showa has an interesting pattern, especially with the beni patch on her left eye. She also has very good skin quality from a young age of 2.5 months old, and the snapshot taken below is not doing her much justice, but unfortunately, this is the only picture we have available of her. Please enjoy the two video clips of the same Marugen Kindai Showa, now at more than 5 months old. Now at more than 5 months old, this Marugen Kindai Showa continues to maintain excellent skin quality; with sharp contrast between the red beni and snow-white shiroji, and a tinge of black sumi patches to provide a well-balanced look. If one notice closely, she does have underlying sumi at the top of her forehead, which when surface above her forehead skin, will only do her more good. Possessing an eye-pleasing pattern, she is far from finish, and have an excellent future ahead of her; a Marugen Tategoi indeed! This Marugen Kindai Showa is currently being groomed in our Marugen Koi Farm’s mud pond facility; where minerals and nutrients that are found naturally in the mud pond, act as essential health supplements for kois to grow healthy and develop better. Marugen Koi Farm is pleased to showcase the growth development of another Marugen Showa, raised in our mud pond facility in Singapore. The comparison is made between a picture taken when the showa was only 3 months old, and a recent video clip taken when the same koi fish is now about 5 months old. At first glance, the 3 months old Marugen Showa (as per picture showcase below) may not appeal to many. But if one look carefully, she actually has a lovely side in her; a basic and simple 3-steps kohaku pattern on white shiroji skin, which is well-balanced by underlying sumi (sumi hidden under the white shiroji skin). What matters now is if the underlying sumi will surface from under her white skin, to make her a more complete showa! Please enjoy the video clip of the same Marugen Showa, now at 5 months old. Within a short period of 3 months, her underlying sumi is starting to surface prominently; which helps to provide a simple yet attractive uniformed-pattern of thick red beni, developing black sumi and snow white shiroji. Without doubt, this Marugen Showa is beginning to blossom into a very high quality and beautiful young showa Tategoi. A classic example of an “ugly duckling” developing into a “graceful and beautiful swan”. With proper grooming, she definitely has a very bright future ahead of her. 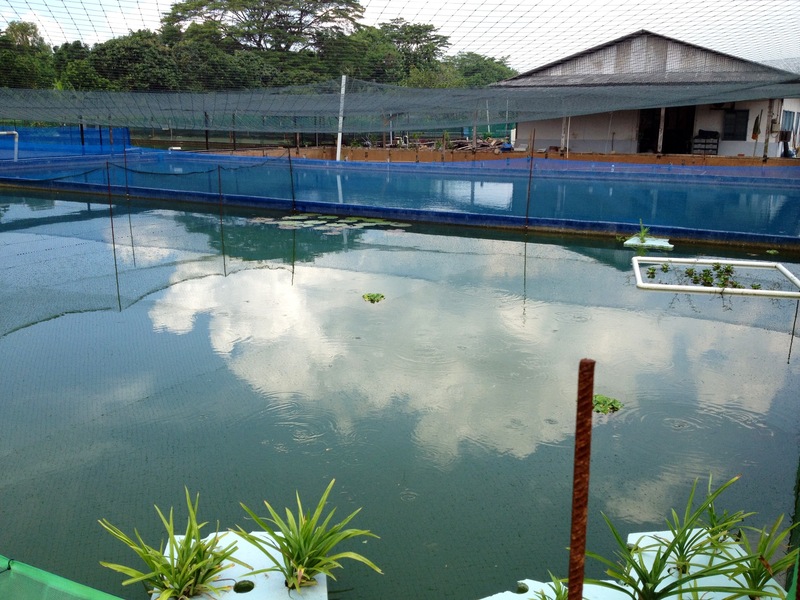 This Marugen Showa is currently being groomed in our Marugen Koi Farm’s mud pond facility; where minerals and nutrients that are found naturally in the mud pond, act as essential health supplements for kois to grow healthy and develop better. Marugen Koi Farm is pleased to showcase the growth development of our customer’s Marugen Showa, comparing a picture taken when the showa was only a young tender age of 3 months, and a recent video clip taken when the same Marugen Showa is now about 5 months of age. 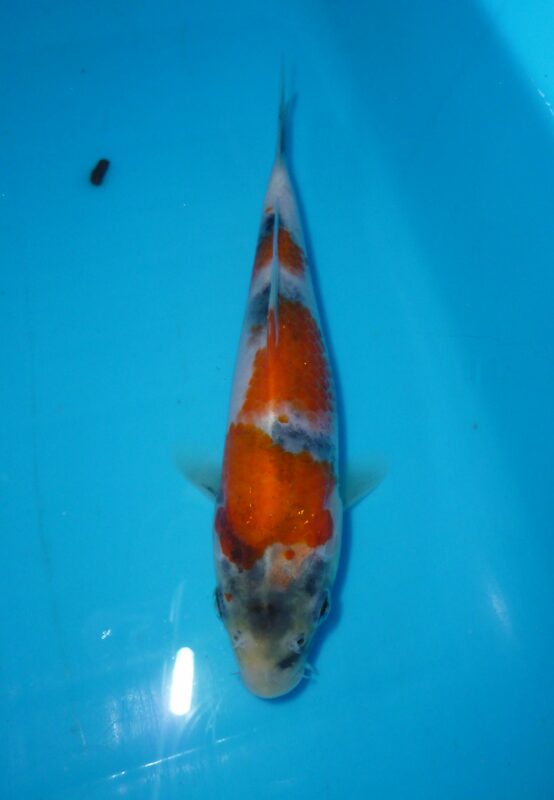 At 3 months old, this Marugen Showa is already a show quality koi, as per picture showcase below. Please enjoy the video clip of this beautiful Marugen Showa, still at a young age of 5 months old. Now at 5 months of age, she has maintained her show quality class, with a simple yet eye-pleasing 4-steps kohaku pattern; thick red beni, seductive kuchibeni, a lovely L-shaped beni patch on her left eye, and well-balanced by snow white shiroji and thick black sumi markings, while not forgetting a nice pair of Motoguru. With proper grooming, she definitely has a very bright future. This Marugen Showa is currently being groomed in our Marugen Koi Farm’s mud pond; where minerals and nutrients that are found naturally in the mud pond, act as essential health supplements for kois to grow healthy and develop better.